Posted October 26, 2015 & filed under Job Prep, Jobs, Rails. Are you thinking about switching careers and becoming a web developer? We researched the job market for developers to create this single Ruby on Rails job trends report, which brings together data from the Bureau of Labor Statistics, Code.org, PayScale, O’Reilly Radar, and more. According to the Bureau of Labor Statistics, in 2010 there were over 900,000 software developer jobs posted, with an expected increase of 30% by 2020. There’s also the often-cited analysis from Code.org that underscored the widening gap between supply and demand (the yellow wedge below). Ruby on Rails (RoR) was designed to put the productivity of the developer first. As a result, companies that want to iterate on product ideas quickly use RoR for their web applications. RoR is an ideal technology for agile software development, and most tech companies follow agile principles to fulfill customer requirements and iterate on their own products. RoR is one of many full-stack web development frameworks, but it happens to be one of the most accessible, thanks to a vibrant community. According to an analysis by Indeed of the relative growth of web development frameworks, demand for Ruby on Rails developers is nearly 5 times the demand for Python, and nearly 10 times the demand for PHP. 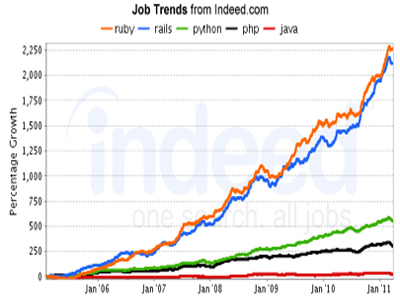 As you can see from the analysis by Indeed.com below, Between 2005 when Ruby on Rails was first released to 2012, the demand for Ruby on Rails developers surged dramatically. In a report done by Quartz, Ruby on Rails developers are paid more than developers programming in other major languages. Ruby on Rails developer jobs pay an average of $77,000 nationally, and an average as high as $112,000 in some markets. We took a look at PayScale’s Median Salary data estimates for median salaries by years of experience for Ruby on Rails. As you can see, with less than a year of experience, the median salary for Ruby on Rails developers is already $60,725, in comparison with entry level Java developers making $59, 422. One of the most common questions we get at Bloc is if you should learn the full stack of Ruby on Rails, or specialize in a particular slice of the stack. The answer: it depends on where you want to work. A full stack developer is someone who knows both frontend and backend development and can move between them. These people understand the whole stack and are thus going to build more complex applications on their own. Our very own Editor in Chief wrote a comprehensive blog post on Frontend v.s. Backend web development. Over 600,000 websites are now running on Ruby on Rails, creating more need for developers. Location-wise, developer jobs are spread out over the world. JLL, a San Francisco-based real estate firm, analyzed the most recent Bureau of Labor Statistics jobs report and found that average San Francisco tech salaries up 19%. They then compiled a list of the top ten markets for high-tech wage growth in the United States. Debating where to live for the best job opportunities? 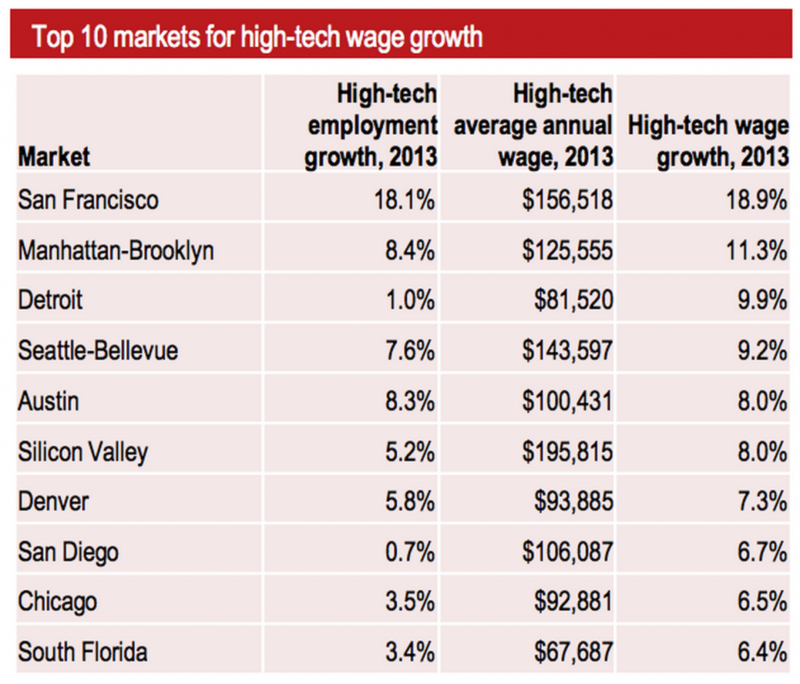 Check out this analysis by VentureBeat of the Top 10 markets for high-tech wage growth. How Are Job Prospects for Bootcamp Grads? Over the course of three years, we’ve seen hundreds of our students graduate and accept job offers as Rails developers. When you graduate, you will have the experience and skills of a junior web developer. 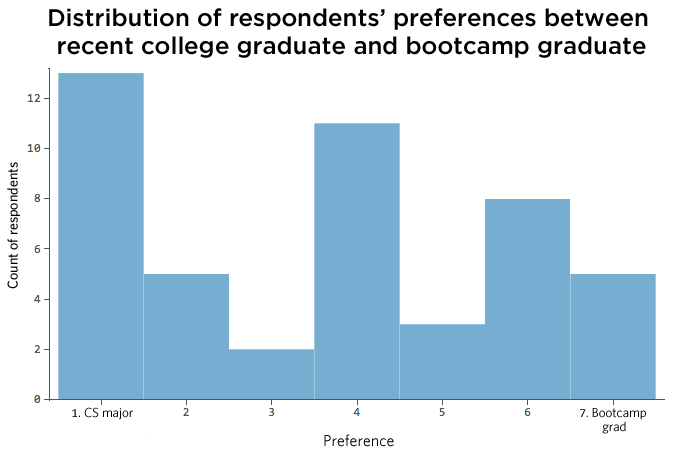 In a recent survey conducted on HackerNews, StatWing asked developers how they would rate the bootcamp-grads they had worked with, and how they would compare bootcmap-grads they had worked with to median computer science university grads they had worked with. As you can see, the distribution is actually fairly even between those developers who would choose CS students vs. bootcamp students. Which is fairly remarkable considering that bootcamps are generally just nine weeks long, compared with a four year degree. (Not to mention, bootcamps cost $5K – $19K, compared with $23K for the average 4-year college degree). Go here for more information on our Ruby on Rails fundamentals program and be sure to check out the Bloc reviews.